Wow! My story in the Dreaming in the Dark anthology just won the Australian Shadows Award for Best Short Fiction (up to 7,500 words) of the year. That's the story "His Shining Day" - I was so chuffed, because I thought I hadn't even been shortlisted! The Shadows Awards are given out by the Australasian Horror Writers Association, and the short fiction one was decided by a panel of four judges. "His Shining Day" isn't horror in the ordinary sense, but definitely dark and disturbing - and, I hope, emotionally moving too. 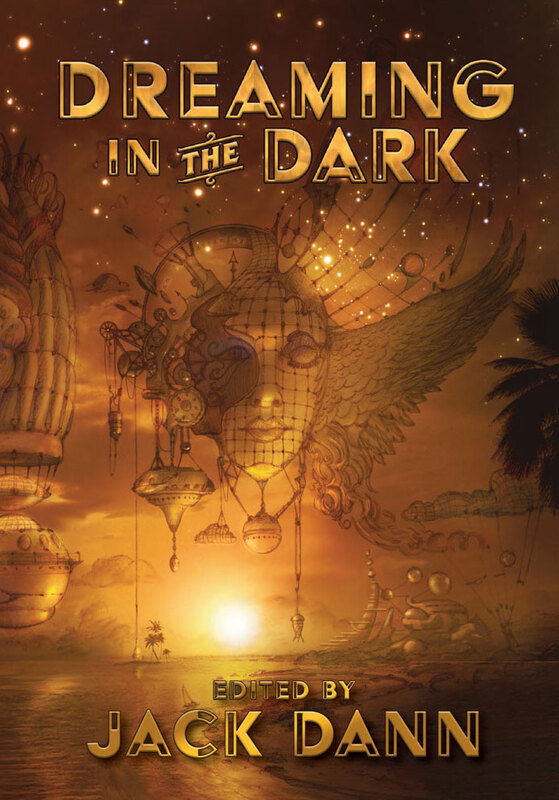 Great to be able to announce that Dreaming in the Dark, edited by Jack Dann and follow-up to the major prizewinning Dreaming Down Under I and II, is now released. Even greater to announce that a myth/horror/fantasy story of mine, "His Shining Day", is in it. 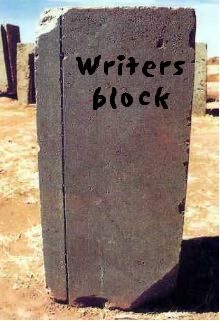 Along with all the very best in Australian spec fic authors. Off to Albury tomorrow, for the Write Around the Murray (WAM!) Writers Festival. School talks and workshops on Thursday and Friday, then an open 2 hour workshop and a panel with Isobelle Carmody and Andrew McGahan on the Saturday. Should be great fun! For the full review, check the Reviews page. Fingers crossed it's the first of many good ones! 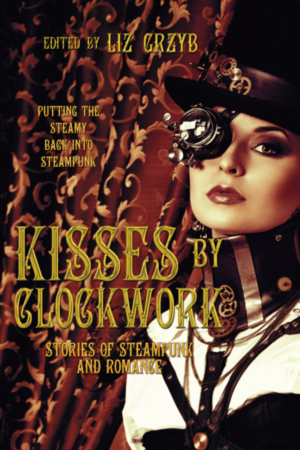 Now out - the Kisses by Clockwork anthology edited byLiz Grzyb from Ticonderoga Press. 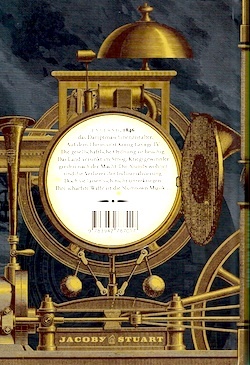 It's a collection of steampunk + romance, and the first story in it is my continuation of the life of Verrol Stark in "The Kiss of Reba Maul". It takes places after the events of Song of the Slums, when the Rowdies (Astor and Verrol's band) are an established success, and Astor and Verrol have settled down to live and love happily-ever-after … or have they? Verrol gets a huge shock when someone rises up out of his past, a woman who was just a young girl at the time of the terrible feud between the Starks and the Mauls. Reba Maul survived the general bloodbath, and she's been training to become the perfect killer ever since. She's deadly and beautiful and attracted to Verrol - but it's a strange and dangerously perverse attraction. Verrol can't help himself when the adrenalin gets into his veins, and his old past criminal self starts to take over again. Be warned: this is not YA/adult crossover fiction, but very definitely adult. Crime and romance, but a dark sort of romance! Yay! 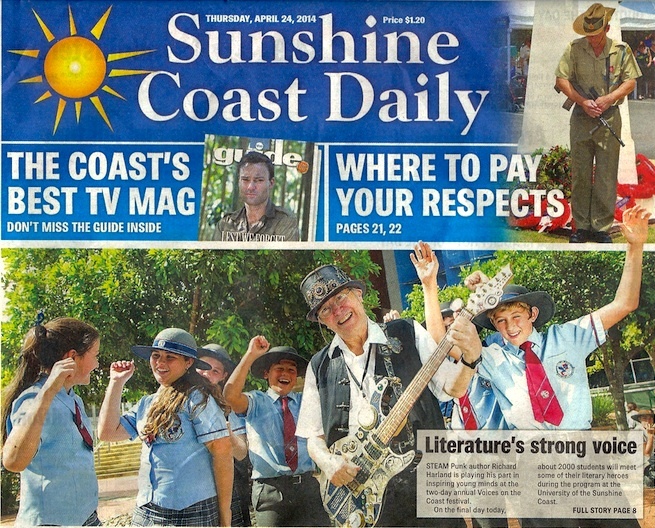 I made the front page of the Sunshine Coast Daily, in their headline item about the Voices on the Coast Festival. In fact, there were dozens of great authors and illustrators taking part - Morris Gleitzman, Stephen Herrick, and so many more. I just happend to be the one with the steampunk hat and steampunk guitar. It was a really good event, hugely enjoyable! 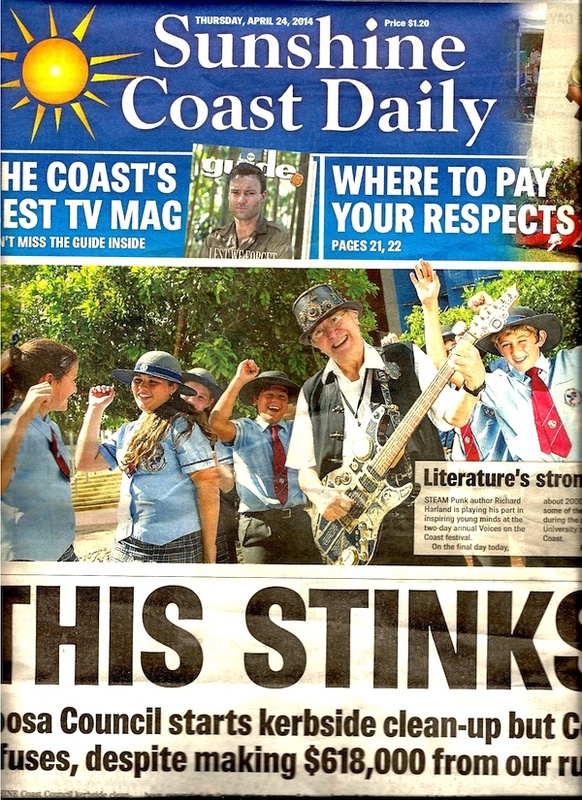 Coming up soon, a couple of days of presentations and workshops at the Sunshine Coast YA literature festival called Voices on the Coast. A sort of working holiday. I'm looking forward to some warm sunny weather! 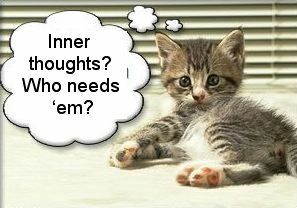 "Ryder" in Dimension6 - free e-zine now out! A major new development in Aus SF publishing - and I'm hugely flattered to be the first story out in it! 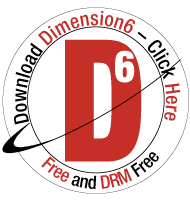 The e-zine is called D6 or Dimension6, brought out by Keith Stevenson of Coeur de Lion Publishing. My story is "Ryder", set back at the time of WW I - but it's not quite the world as we know it. Something has happened in a small outback town - Ryder knows the secret, and he's going to introduce Sally to it, whether she wants or not. Here's the link for the first issue of D6 - totally free, and includes a great future SF story by Charlotte Nash and an undead-with-a-difference story by Jason Nahrung. Anyone who's into Australian SF has to get in on this! Browse, read, support! Just back from Perth - it was frantic, driving every which way - but very satisfying. I like Perth! The temperature never got up to 38 degrees, but it hardly dropped below 30 either. By unexpected coincidence, I was there for the wedding of Liz Grzyb and Russell Farr, which took place on a grassy lawn at Perth Zoo. A very happy event it was! When I got back, I discovered my author copy of Strange Bedfellows, a Canadian anthology that includes my SF story, "Homebody". 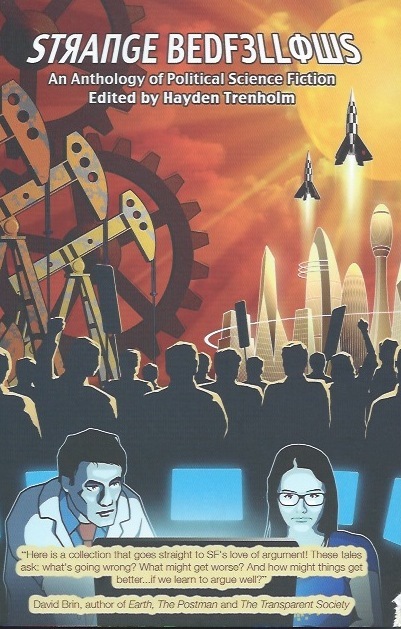 It's described as 'an anthology of political science fiction' - and although "Homebody" is anthropological speculation, like so many of my stories, it is political too. 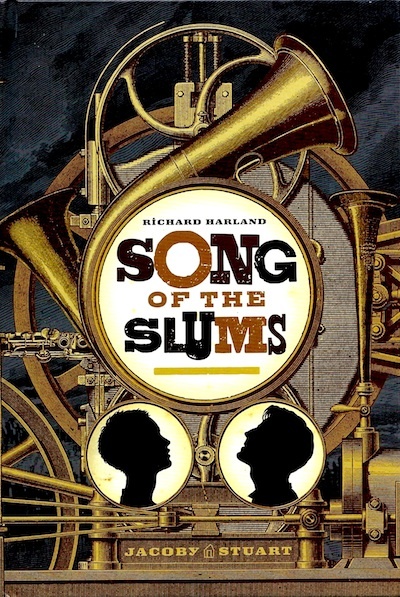 “Homebody,” by Richard Harland, who is most frequently published by Penguin and Pan MacMillan, and is the author of the upcoming Song of the Slums, is the most powerful story in my view. Disturbing and subtle, it holds a mirror to the reader by which to examine his/her cultural tolerance. It’s a story of both wanting a Starbucks in every country you visit, but also an experience of fresh newness, just not too fresh or too new. I experienced this in living 6 years overseas in Latin America, both embracing and rejecting immersion, and knowing the feeling of retreat from strangeness, very much like the nest of the story. Harland sets up some specific reader expectations, before turning sideways, leaving me and the hero scratching our heads, not in a bad way, but in a way that shows the cultural gulfs that separate cultures and have everything to do with how we deal with other nations and even with different regions of our own countries. Song of the Slums - the trailer! Here it is - the trailer for the new steampunk novel, Song of the Slums! 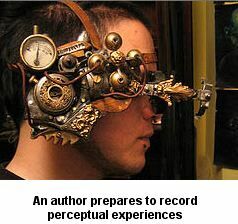 I'm totally in love with it, so bizarre, so quirky! I'll embed it in the Song of the Slums pages too. I couldn't bear to leave Perth off my Song of the Slums touring, even though it's so delayed, 9 months after the book's release. They've been so supportive in the past. I've never squeezed so many visits in before - it'll be frantic! There's Melbourne Ladies College, Perth Modern, John Wollaston Anglican, Seton College, Wesley College, Penrhos Girls, Chisholm Catholic College, St Marks, Prendiville Catholic, Ursula Frayne College, Scoth College, St Stephens, Lumen Christi, Iona Presentation College, St Hilda's Girls and Santa Maria Girls. 16 schools in ten days! I'm looking forward to it - bar one thing. The weather forecasts have done a total turnaround. They were saying two really hot days followed by cooler, but now it's hot for the first week, climbing close to 36 degrees until Friday- and continuing at around 30 degrees for the next week. Phew! Wow! Fast work by my French and German publishers. 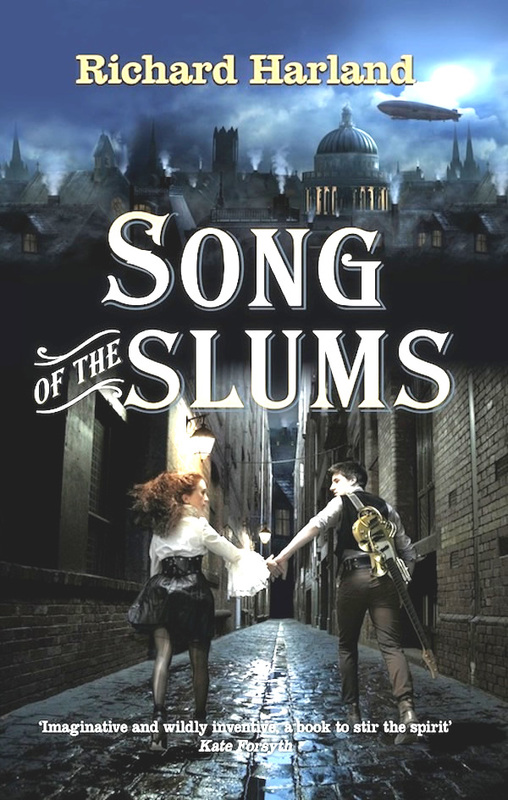 The translations of Song of the Slums have been finished in double quick time - by Valérie le Plouhinec and Nicola Stuart respectively. 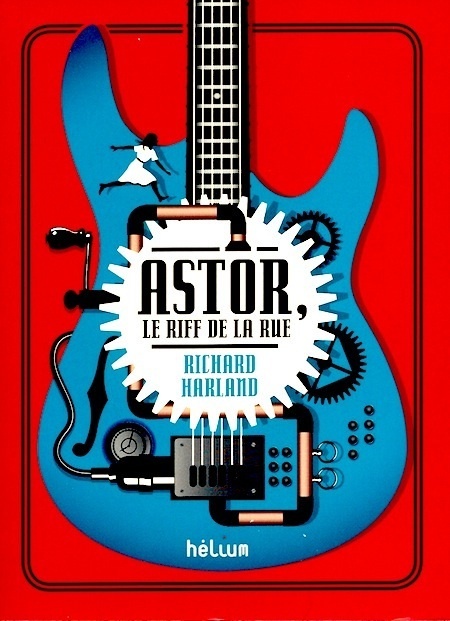 The French edition comes out mid-October, the German edition may be in the bookshops already, I'm not sure. The two covers follow the model of the French and German Worldshaker and Liberator - very different styles! Yay! 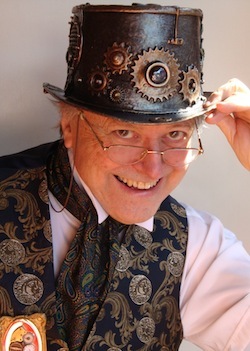 I've been invited as a guest author to the Brisbane and Adelaide Supanovas - and rubbling shoulders with the likes of George R.R. Martin at the Authors table, and a whole lot of Game of Thrones stars in the Green Room and elsewhere (e.g. Tyrion Lannister, Robert Baratheon, Bron) - not to mention a heap of other stars too! I'll put up more of the guest list closer to the time. Many great Aus authors, many overseas stars from TV and movies. I've been saying I'll do it for so long, and I've finally done it. This home page has been getting ridiculous, filling up with masses and masses of news items going back for months and years - it was just such a daunting job to move it to the News & Blog page, and get everything in the right order. But I've done it. I'll just put a box on this page naming some highlight items now in News & Blog, plus the latest important stuff, which will only stay up for a few weeks before it moves across. (Like the Supanova guest appearances). I've also given up trying to keep News and Blog separate on the News & Blog page - instead I've made 'News' into future news of 'Coming Events'. My steampunked guitar! I bought a secondhand guitar and took it to Lewis Morley, who's worked on models for movies like The Hobbit, the Matrix movies and two of the Star Wars movies. With laser cutter and sheer imagination, he created this beauty. 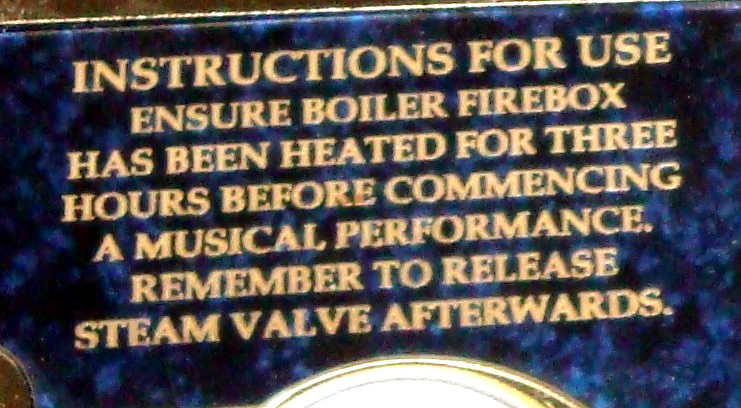 All sorts of bits and pieces, cogs and guages, handles and doodahs. I produced the website as my community service to Australian fantasy/SF writers, but it's had such great feedback, that I thought it ought to go overseas too. My overseas editors have helped me adapt parts of the last "Getting Published" section for overseas conditions - though actually there weren't as many differences as I expected. So check it out if you're interested in writing, or even if you're just curious about what goes on behind the scenes in producing a book. Each version can be read on the web or downloaded for free and printed out like a small book. No strings attached - it really was a community service. Lots of little illustrations too … in fact I'll copy a few of them now.